Ivo Andrić (Serbian: Иво Андрић) (October 9, 1892 – March 13, 1975) was a Yugoslav novelist, short story writer, and the 1961 winner of the Nobel Prize for Literature. His novels The Bridge on the Drina and The Days of the Consuls dealt with life in Bosnia under the Ottoman Empire. The Bridge on the Drina (Serbo-Croat: На Дрини Ћуприја or Na Drini Ćuprija), his most famous work, describes the relations between Orthodox Christian Serbs and Muslims in the town of Višegrad in eastern Bosnia and Herzegovina during the centuries of the Ottoman occupation. The story covers a period of about four centuries and is in some sense a collection of short stories. What unites the book and becomes in a sense the main "character" is the bridge over the Drina River in Višegrad, now eastern Bosnia and Herzegovina. Andrić's work addresses the problems involved in the creation of the multi-ethnic Yugoslav state. Andrić was born on October 9, 1892 of Croatian parentage in the village of Dolac near Travnik, Bosnia and Herzegovina, then part of the Austro-Hungarian Empire. Originally named Ivan, he became known by the diminutive Ivo. When Andrić was two years old, his father died. Because his mother was too poor to support him, he was raised by his mother's family in the eastern Bosnian town of Višegrad on the river Drina. There he saw the Ottoman Bridge, later made famous in the novel The Bridge on the Drina. Andrić attended Sarajevo's gymnasium, later studying at the universities in Zagreb, Vienna, Kraków, and Graz. Because of his political activities, Andrić was imprisoned by the Austrian government during World War I (first in Maribor and later in the Doboj detention camp) alongside civilian Serbs and pro-Serb southern Slavs. Under the newly-formed Kingdom of the Serbs, Croats, and Slovenes (later the Kingdom of Yugoslavia), Andrić became a civil servant, first in the Ministry of Faiths and then the Ministry of Foreign Affairs, where he pursued a successful diplomatic career, and where he served as Deputy Foreign Minister and later as Ambassador to Germany. Andrić greatly opposed the movement of Stjepan Radić, the president of the Croatian Peasant Party, at occasions calling the people that supported him fools that follow the footsteps of a blind dog. His ambassadorship ended in 1941 after the German invasion of Yugoslavia. During World War II, Andrić lived quietly in Belgrade, completing the three of his most famous novels, which were published in 1945, including The Bridge on the Drina. After the war, Andrić held a number of ceremonial posts in the new Communist government of Yugoslavia, including that of a member of the presidency of Bosnia and Herzegovina. In 1961, he was awarded the Nobel Prize for Literature "for the epic force with which he has traced themes and depicted human destinies drawn from the history of his country." Following the death of his wife in 1968, he began reducing his public activities. As time went by, he became increasingly ill and eventually died on March 13, 1975, in Belgrade (then Socialist Federal Republic of Yugoslavia and today Serbia). Andrić's works are hard to classify: he was a Serbian writer, writing in both Serbian (predominantly) and Croatian (earlier works of poetry and novellas, around three percent of his opus), and he was a believer in Yugoslav unity and quasi-racial Slavic nationalism before World War I. His political career, combined with extraliterary factors, contributed to the controversy that still surrounds his work. Andrić was at his best in short stories, novellas, and essayist meditative prose. Brilliant aphorisms and meditations, collected in his early poetic prose, namely Nemiri ("Anxieties"), and, particularly, posthumously published Znakovi pored puta ("Signs Near the Travel-road") are great examples of a melancholic consciousness contemplating the universals of the human condition—not unlike Andrić's chief influence, Kierkegaard. His best short stories and novellas are set in his native Bosnia and Herzegovina and frequently center on collisions between the three main Bosnian nationalities: Serbs, Croats, and Bosniaks. Although social and denominational tensions are the scene for the majority of stories, Andrić's shorter fictions cannot be reduced to a sort of regional chronicle. Rooted frequently in rather prosaic and pedestrian Bosnian Franciscan chronicles, they are expressions of a vision of life, because for Andrić, as for other great regionalist authors like Hardy or Hawthorne, the regional illuminates the universal. With the collapse of Yugoslavia, other, though now suppressed, doubts about Andrić's work began to appear. The commonest charge was that Bosniaks were portrayed stereotypically in Andrić's work and in a hostile and condescending manner. Some circles of Muslim Bosniak intelligentsia have raised these accusations to a significant degree, detecting positions and tendencies that could have, if displayed outside of a literary opus, earned Andrić the reputation of a Greater Serbian propagandist and pamphleteer. Since Andrić primarily wrote fiction, such accusations remain hard to substantiate. Since the project of Yugoslav literature collapsed (just like Czechoslovak or Soviet "literatures"), a squabble about where to place Andrić has begun. Serbian culture and tradition have the strongest literary claim. The majority of his works were written in the Serbian language and he was, as far as the former Yugoslav area is concerned, influenced decisively by Serbian cultural icons such as Vuk Stefanović Karadžić and Petar Petrović Njegoš, who both figured in a few of Andrić's essays. Accordingly to Serbian critic Borislav Mihailović-Mihiz, Andrić allowed him to be included in Mihailović's Anthology Of Serbian Poets Between The Two World Wars (Српски песници између два рата). Nonetheless, Croatian curricula at high schools and universities include Andrić among other writers in Croatian literature departments and programs based on his ethnic origin. Andrić was of Croatian origin. It is assumed that "jelena, žena koje nema" is dedicated to Andrić's secret love Jelena Trkulja. Andrić's work is now in the official curricula of Croat and Serb literature programs, and, grudgingly, in that of Bosnian Muslims. Since aesthetic sensibilities have significantly altered in past decades, a traditionalist storyteller like Andrić is both a politically controversial figure and literarily a somewhat marginal presence. Many Croatian historians of literature have never considered him an equal to Miroslav Krleža. Serbs, for their part, affirm the aesthetic primacy of Miloš Crnjanski and Bosniaks (Bosnian Muslims), that of Mehmed Selimović—a Bosniak writer who, like Andrić, "opted" for Serbdom during a major part of his life. "Bosnia is a country of hatred and fear. "- Ivo Andrić, 1920. Andric, Ivo. The Bridge on the Drina. The University of Chicago Pres. 1977. The Nobel Foundation. 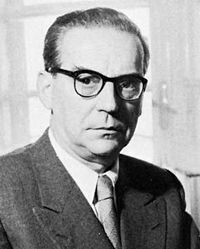 Ivo Andric: The Nobel Prize in Literature in 1961. The Nobel Foundation. Presentation Speech. This page was last modified on 10 March 2018, at 23:06.